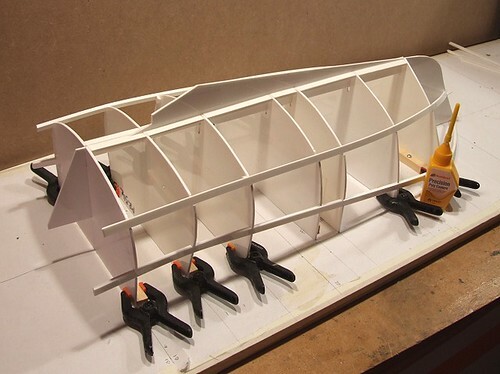 Progress has been made with the Brede lifeboat project. I've got a deadline and this model is taking longer than I expected. The hull is clad in sheets of plastic over the formers. 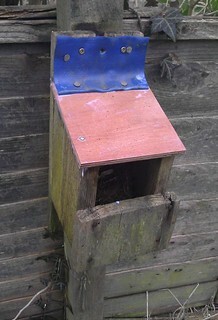 These have been reduced in height and a deck fitted. Checking with a ruler shows that everything is as accurate as eyeballing along the sides makes it appear. I am much relieved by this as I really didn't want to make another hull. Above the deck line, a superstructure is appearing. It might look a bit rough but I think I know what I'm doing. Those window holes will be tidyed up with overlays for the frames. The bottom edge is hidden behind another strip which the prototype handily has. I'm very proud of the fact that everything you see has been scratchbuilt. It was all sheet plastic a few weeks ago and now looks a lot like the boat it is intended to represent. There is something incredibly satisfying about the process even if it is frustrating at times. Maybe it's overcoming the problems that provides the pleasure, or maybe it's just that I've created a reasonable size model and it's looking OK. Maybe a man in China with an injection moulding machine could do better but I'm pretty sure he isn't interested so I'll have to live without him. The box of East German TT trains have been hanging around for a while so a couple of days ago, we decided to have a proper look with a view to handing the whole lot over to a dealer. In an effort to secure a decent offer, all the locos were checked to see if they worked. As it turned out, despite being dusty, with a bit of prodding from some 12V DC, they all did. 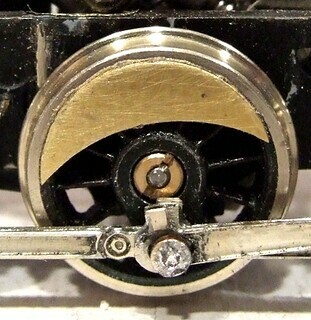 We soon had little engines running around a 2ft diameter circle on the dining table. All good fun. Looking under the BR 107 engine, I spotted that the makers had been rather clever. While it might look as though the engine runs on a pair of bogies, it's a fraud. In reality, the mechanism is a simple 4-wheel unit with the outer bogie wheels swinging around like pony trucks on a steam engine. Given the limited swing of the bogies and crudeness of all the running gear (those treads are huge) everything looks like it should. I'm not sure if this helps anyone but I bet there are some narrow gauge fans out there who could use a similar trick. I hope everyone appreciates this. Getting to this stage took at least 2 hours! 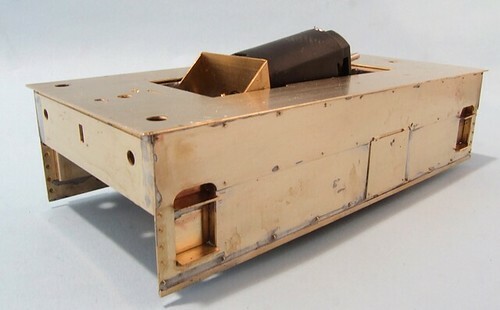 After yesterdays admission of error, I attacked the soldered joins making up the smokebox/boiler/firebox unit and reduced the parts to brass bits with blobs of solder on the edges. Mr Gas torch was very useful here as I could zap heat into the joints and shove scalpels into the3 metal to prise apart the components. After this, re-assembly was simple-ish. Yes I had to file some of the solder blobs away with a coarse file. Others were melted and smeared around the metal so they didn't get in the way. I didn't burn my fingers and even remembered to shorten the boiler very slightly for a better fit. It's not pretty under there but since no-one will see, I don't care. After cleaning up, the whitemetal bits started to find their way on, held in place with superglue. I reckoned I'd finished soldering until I spotted that the nuts to bolt the thing to the chassis haven't been fitted yet. Good job they are well away from the glued on bits! Of course the sharp eyed will have spotted that the floor is still back to front. The difference between the two ends is the holes for sandboxes and I will hide these when I make up a new wooden floor. Oops. I had a horrible feeling this would happen. Now I have a completed body, if I place it on the skirts and peer down through the chimney hole, it doesn't line up with the hole in the smokebox. You see, there are two wrappers in the boiler area - once for the firebox and another for the smokebox. One is narrower than the other. And I got them the wrong way around. Smokebox wrapper on firebox and the hole in the roof doesn't line up. I could just fit the chimney through the roof and be done with it. Seeing the compromise would be very difficult once the body is on. The trouble is, I would know it is wrong. So, I now have to dismantle the various bits in the middle and put them together properly. The way I would have had I looked at the plan so generously provided by Tanllan. Good job this is fun isn't it? I've got the proper tool, so this time I'm going to use it. Having spent all that money years ago on a nice set of GW Models rolling bars, it seems that the tram loco roof should make use of them. If I'm honest, they aren't the easiest tool to use - no fault of the tool itself which is fantastic, it's just that I only sort of get how they should work. As I understand it, the top roller is slackened off, the metal inserted between them and then the roller is tightened again. You roll the metal back and forth to impart a bend. 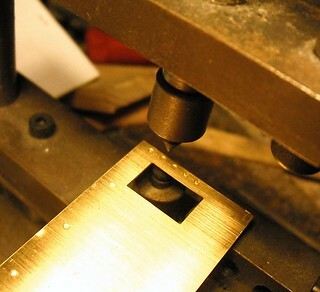 Then the top roller is screwed down further, the metal rolled again for a sharper bend. This process continues until you have a tube if that's what you want. I managed to over-bend the roof but placing it on a flat surface and gently pushing down on it reduced the curvature until it fitted the body. Then it was tack soldered in place before the seam joints were finished with the gas torch. A touch of cleaning up and the job is done. And yes you could just bend the thing around a beer can. It's just not as "proper" as wot I did. OK? Well, it is a bit shed like isn't it? To be honest there's very little to say about this stage of construction. The ends make up with rebates to accept the sides, solving the old "Do the sides overlap the ends or vise versa?" question. All I had to do was tack solder everything together and once happy, run more solder into the joints to make it all secure. There aren't guides to aid locating the body on the footplate but this isn't much of a problem. I worked by eye so am probably a fraction of a mm out. Not enough to lose sleep over. There is a lot of brass at this point so the final joins between body and footplate needed the heat of a gas torch rather than just the soldering iron. I probably could have got away with it but the torch is faster and I still enjoy blowing hot solder along a join. With the snow ten feet deep outside, what better time to think about ways to model a cornfield at the height of summer - when the snow will only be five feet deep. 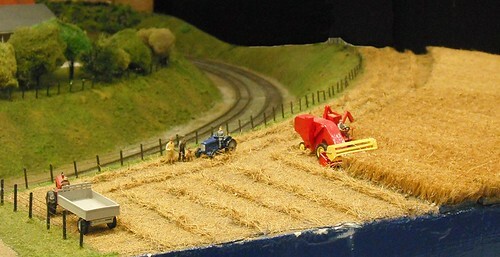 Looking at the scene above, I wondered if the modeller had used some sort of matting to produce the corn. The stalks look far too tightly packed and regular for anything planted by hand. Having spent many hours producing fields using plumers hemp, I know how difficult this can be! Anyway, a few days later, I'm wandering around Ikea when I spot the doormat selection. From a distance, they certainly have a look. The lightling in the store makes the colours far too orange. 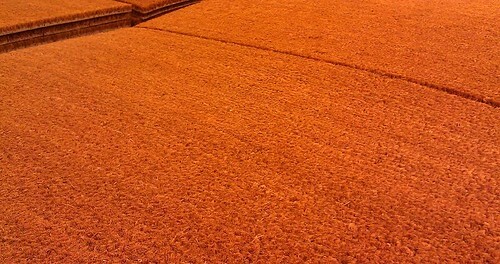 You even get the straight lines where the corn has been sown along furrows. Trimming to look like harvest might be difficult - those bristles are tough, but I wonder if there are possibilities here? Some shows require a day trip, others quite a bit less. My feelings toward the Larger Scale model railway show were that a couple of hours would be enough. Planning to back in time to make some lunch, I bunged a potato in the oven on a low heat and headed off. The show is 10 minutes drive from my home and most of this took place in light snow. The car park was being organised by freezing stewards carefully parking people on the edges of the roadways so they didn't have both wheels in the soggy grass. Inside, the exhibition centre was nicely full. First up there was an O gauge foreign layout and beyond this the Gauge 1 test track. The air was thick with meths and steam - always a good sign. There was some top scratchbuilding on display. The little Simplex G class at the top of this post is a gem. 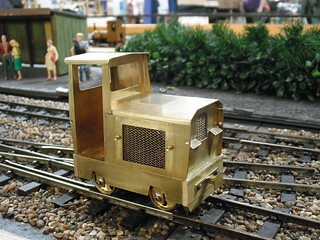 Powered by a Romford Bulldog motor and with both axles driven through a simple set of bevel gears, it runs on wagon wheels and is built to 16mm the foot scale. I look at this sort of model and realise that I could do this, even the engineering bit (probably). 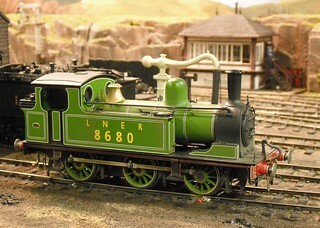 What's more, I am really in the mood for a scratchbuilt railway project right now. Not an oddball diesel perhaps, but it is inspirational. Not everything is within my grasp. Looking at a live steam loco "in the brass", I realise that I'd need to learn a lot of engineering to achieve anything similar. It doesn't mean I can't enjoy it though. Anyway, a good time was had. Fortunatly I like my jacket spuds good and crispy. My Dad reckons it is 30 years since we first visited Nottinghams model railway exhibition. 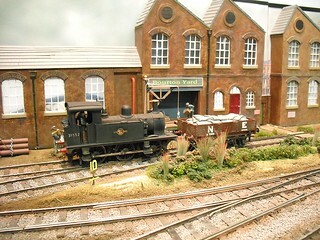 Back in those days, O levels were a couple of years away for me and we had just joined the local model railway club. Other members told us that Nottingham was one of the shows to visit and since we'd never actually travelled to an exhibition, we hopped on a train and did just that. We visited quite a few times in the intervening period but stopped when the venue moved from a handy in-town site surrounded by top quality greasy spoon fish'n'chip shops (yum) to a sports centre, apart from a trip last year, we've not been back. This year however, we thought it would be fun to visit again. While there may be free car parking on offer, this apparently comes with "security" which makes me wonder what sort of area the show is held in. It looks OK but since I'd prefer to go by train anyway, that's what we did. Having enjoyed the trip, dropped into GeeDee Model shop and stuffed our faces with a Weatherspoons Brunch, we followed the instructions to find a bus. This was easy enough and we sat on the top deck gawping at some of the scruffier, but very interesting areas of the city. Sadly I hadn't spotted the instructions telling us where to get off so when the route diverged from the signs for cars, we hopped off and had a 40 minute stroll to the show itself. It might have worn off some of the lunch but I could have lived without it, especially as I recalled the previous years stop being opposite the hall. One problem for the show organisers is that the hall used in the past is being renovated so they've had to move into a college next door. Initially this was for a year but now 3 years looks more likely. The new venue is like most school based show - a nightmare. There is an assembly hall and sports centre offering descent floor space but the show is too big for these leading to exhibits dotted everywhere. This isn't the organisers fault, everyone who uses a similar venue has exactly the same problem. At least the Nottingham stewards were easily found and never less than helpful directing people around. At this point I should provide a critique of the event but truth was that when we got there, it was difficult to see the layouts due to the crowds and even if we had been there for that, there were many old friends to catch up with so we spent a lot of time chatting. OK, so the GWR numberplate might have been a challenge as would the shed plate but waterslide transfer numbers? What's odd is that the trade was good. There were many specialists that you don't see at other shows and the hall certainly hadn't been filled with RTR box-shifters. I guess I was just unlucky. Layout wise, things were good. I'll be honest and admit to not spending much time gawping but there was a cracking 2mm finescale branch line and some roundy-roundys that were providing much entertainment. The walk back to the bus took 25 minutes and I'm glad we missed the rain. With a bit more pre-planning I think we can sort this. To be honest though, the venue isn't inviting although I'm sure lessons will have been learnt this year. 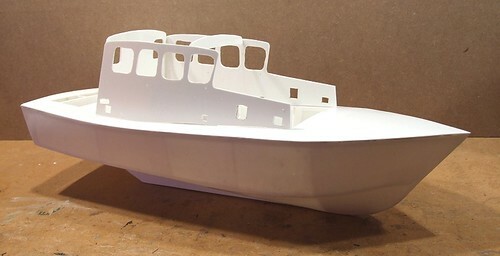 Long time readers of this blog will know that I've had a couple of goes at building a model of the Brede Class lifeboat. Attempt 1 involved a not very good vac-formed kit which got me interested in the prototype but proved just how difficult it would be to make a descent model. Attempt 2 got as far as a scratchbuilt hull that looked good until I put the deck on and realised that the back end on one side was all wonky. Attempt 3 uses a similar assembly method to Attempt 2 except that in that case I used wood, this time it's plastic sheet. My theory is that I'm more comfortable with plastic. It's a material I use a lot and I get on well with it. Unlike wood for example, if you cut too much off, the missing material can be replaced as long as yo use plenty of solvent. The good people at Humbrol have sent me some tubes of glue and a big bottle of liquid glue. My stocks include plenty of Mek-pak too. Anyway, I made up a building board - a flat surface with screwed down laths at right angles to the edge. To these slices of the hull are clipped. 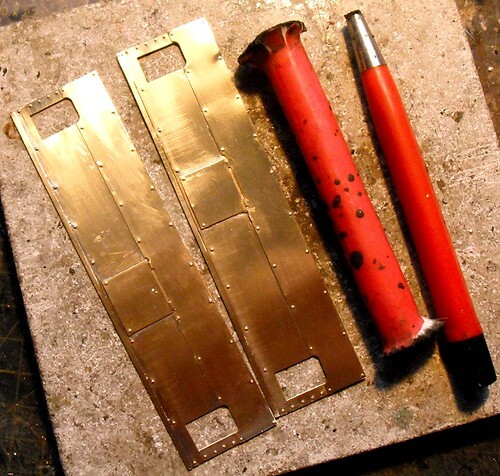 These slices are taken from a copy of the RNLI plan, stuck to the sheet with spray glue and then slightly modified to take the keel and stringers. Both of these are plastic, the later being long strips of sawn 4mm stuff bought from a model boat supplier. So far, things are looking good. Hopefully at the end of all this, I'll be writing up the model properly for Model Boats magazine, but I thought you might like a sneak preview. 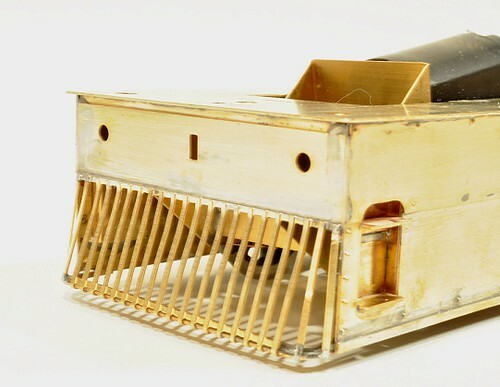 The Y6 tram engine sides are another neat piece of design. Each is a super-sized etching that folds back on itself to provide depth of detail and beef what could otherwise be a flimsy item up a bit. In addition the centre panel is another separate part, handily half-etched with a groove on the back to ensure alignment. 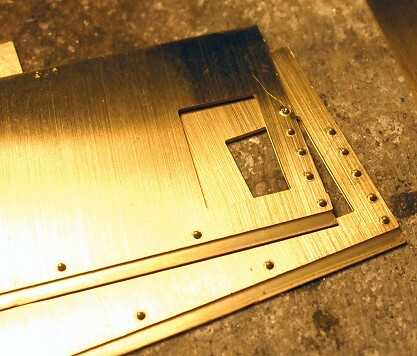 Assembly is simple - fold the parts and run solder around the edge. Attach the centre panel by running solder around the edges of this. Burnish like mad to remove the excess solder. Clean the sides up to remove solder and etch tabs. Finally, fit a strip to the top of each side. The half etched parts in the doorway are there to make it harder to bend the frames in and keep the whole thing square. I'll take them out when the sides are firmly fixed to the floor. 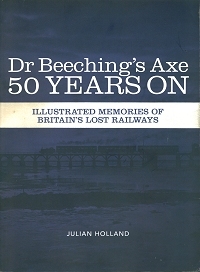 Marking the half-century since Dr Beeching's famous report on Britian's Railways - a report infamous for suggesting a drastic pruning of a much loved network - Julian Holland has listed every line closed at the time and provided a short history. The book begins with a background to the report and it's effects. Holland is an enthusiast and this shows throughout the text. He points out that the statistics upon which the network was condemned were gathered in a single April week. Tranport Minister Earnest Marples is described as "motorway mad" although pedants will point out the motorway construction company was run by his wife and in no way will have influenced his decisions. Beeching himself comes out things fairly well. He was asked to do a job and that is exactly what he did. In many ways, Holland proves his point - most of the line histories describe run-down and very lightly used services. They might have been valued by the communities that they served but often those same people preferred to use the new and shiny Ford Popular on the drive than a wheezing steam train that ran infrequently with old and uncomfortable rolling stock. An optimistic note is struck where possible. History is brought up to date in places and some of the lines are being re-opened either by preservation societies or even local groups undoing the work of BR. Photographs illustrate each line and these will be valuable resources for modellers looking to show the railway in the 60s and 70s. Amazingly, some of the closures didn't take place until the so we have both steam engines and blue and grey DMUs. The book design is very pleasing to the eye too. Everything is well laid out and clear. There's even a comprehensive index at the back. Ray asks: What is the easiest way to mask railway wheels when spray painting them? The simple answer for me is: Don't bother. Because all the locos I build have black wheels, I don't bother masking them off. The chassis is painted once I'm happy with the running. Then it's dismantled, cleaned, primed and painted. If I'm feeling clever, the wheels get a coat at this point too. A quick shot of primer and then the same paint as the chassis. Treads and flange backs are polished clean - this process can be made a lot easier if you remember to wipe some WD40 from the no-mess pen on the parts to stay shiny first. I'm just as happy to paint the wheels by hand when they are back in the chassis. Cleaning treads is then carried out by flipping the loco upside down in a Peco cradle and running it while fibre penning the paint away. If it's sticking really well, I'll lightly apply a scalpel to the treat as it spins but very lightly - the paint wants to be removed, not any metal! All of this would be different for a set of lined wheels - you'd have to do this before re-fitting them or go mad playing "dodge the waggly bits". I might also think twice if I was using Gibson or Sharman wheels. Slaters and especially Romfords can be treated in a caviler manner such as this with no ill-effect whereas plastic centred jobbies might complain a bit more. Since I want the body top to separate from the skirts, I've modified the upper footplate by hacking a great big hole in the middle of it. To be fair, "hacking" is probably wrong. I carefully measured the hole to be made, cut around the edges with an Olfa Plasticard cutter and then used my piercing saw to help access these marks and open the metal out to them. Then I tack soldered the footplate in place, drilled a couple of holes and fitted 8BA nuts and bolts. Now I can build the body on this and remove it with a little screwdriver work. The chassis can stay attached to the skirts. All I need to do is unsolder the tacks and get on with the sides. 10 years or so ago, the place I worked took part in Learning at Work Day. I trained people in juggling (Since I normally ran courses in web page creation, something a bit more interesting seemed in order) and then took the opportunity to have a go at building a robin box, run by one of the Park Rangers. On the footsteps of Shire Hall in Warwick, we hammered together some bits of wood to make a suitable homes for our red breasted friends. I took this home like a child who'd made something at school, and screwed it to a fence post. Over the years, a couple of birds have made the box their home but as the wood was never protected with varnish or preservative, the roof rotted away. Anyway, the time had come to provide the birds with a new roof and as it happens there was an offcut of 9mm plywood left over from building Clayhanger Yard more than large enough for the job. A few minutes with a square, pencil and saw and I was able to nail the new lid back in place. I even varnished it with a couple of coats so it's a bit more rain-proof. Sometimes, when I apply transfers to a model, they don't work very well. I'm sure I'm the only person this happens to - except it appears I'm not. 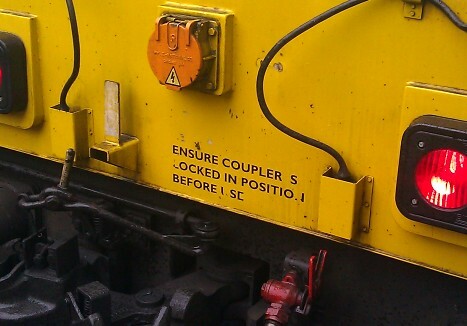 Seen on the front of a Chiltern Railways Class 67 diesel, these look just like my efforts sometime turn out. Most of the letters are there but not all of them. If I produced something like this, I'd probably start thinking about doing them again. Not any more! Chiltern Railways - Excellent trains and not excellent excuse for modellers! Have I got this the right way round? I'm making some changes to the way the Y6 tram engine goes together compared to the way the manufacturer intends it to be assembled. 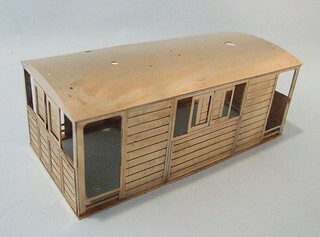 On my model, the body and roof will be one part, the footplate and skits another. The chassis fits under all of this. As supplied, the kit makes it pretty easy to do this - there are two footplates so I can hack a bigger hole in one, arrange for it to bolt down and solder the sides and roof to it. Inside there is a boiler, fire and smokebox. The hole will need to be big enough to fit over these so I've fitted them now. This has highlighted a problem - I think I've put the footplate in back to front. You might think this doesn't matter but looking at the side view, there is a flap in the skirts that is off-centre. It's towards the front of the engine, presumably to allow access to the motion for oiling. On the footplate there are two holes for (I think) sandboxes and these should also be at the front. They aren't on my model. Since I refuse to take the skirts apart to fix this, I'll live with it. The smokebox has been placed at the correct front, where it should be under the chimney hole. Assuming this works OK, I'll carry on. Time to build the body next. I should say that at this point only the brass bits have been fitted. There's a load of whitemetal to go in here and if I can find more information, some scratchbuilding too. That can all wait until the big bits are made and I'm happy all is well. If I have to unsolder anything, then the less the batter. 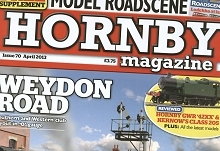 We're pushing the envelope a bit in the latest issue of Hornby Mag. 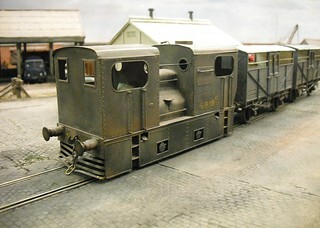 While many people would consider building an etched kit well beyond them, the editor has allowed me to have a go at explaining the basics using a Craftsman 0-4-4 as the basis. 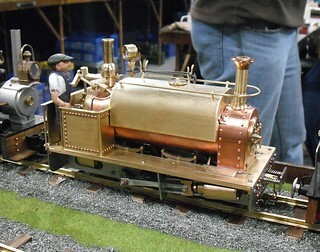 We've done etched kits before of course, there's an 02 diesel in the Parker's Guide bookazine, but a steam engine is another step on, especially one with a (possible) problematic wheel arrangement. It's quite a nice kit and this is actually the third time I've built it. While not an obvious choice, you can't buy one RTR. There's not horrid waggly bits on the outside either. Best of all, the kit, while old fashioned in many areas, is a good solid model which uses tabs and slots for much of the part alignment. OK, so the finished model won't be as perfect as the latest RTR, but the missing bits won't be noticed on the layout. The satisfaction of running your own engine will more than make up for this. Elsewhere, I'm making wagon loads up using various methods. 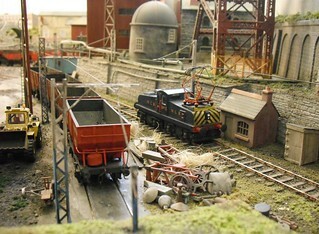 To help the readers, Geoscenics have produced some kits for this exclusively for Hornby Magazine. 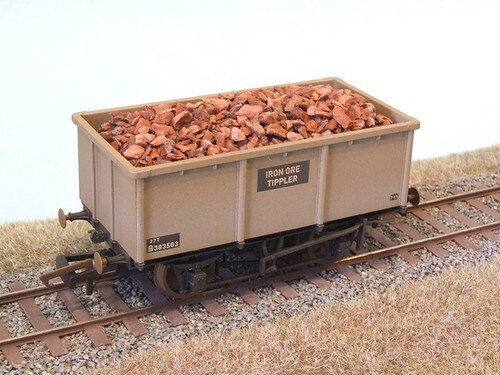 I've used these and 4 other techniques to fill wagons and they all work well. Even if you don't use the supports from the kit, the coal, iron ore and stone toppings are excellent. Good value too as one kit will do a train - well a normal length one, when your Garratt turns up. you might need to buy two for all those wagons! 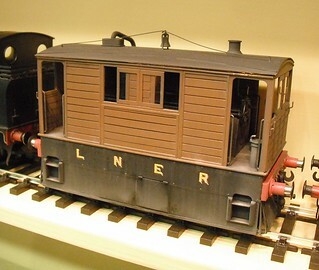 Clayhanger Yard gains a fiddle yard and also appears in public for the first time. For an O gauge layout, I didn't fancy sliding or spinning yards. Buying points would be too expensive and result in a yard as long as the layout. Therefore, we've gone for cassettes. Simple to build and very effective, I'm pleased with the results in use on the model. In addition, I picked up a temporary membership card and an extra journal backnumber. I know the temptation for many when they see a scale society offering membership at an exhibition is to take the leaflet, smile politely and then lose the paperwork. They do this even if the intention is to join. It's difficult to compete with the lure of having some goodies to take away from the event and the promise of some interesting post in the future often loses out to the immediate gratification of taking away some packets of goodies. This way, the new member has a physical manifestation of the results of thier spending. A heavy rucksack is a reminder that you have something for your money - better still, there is the promise of good things to come. 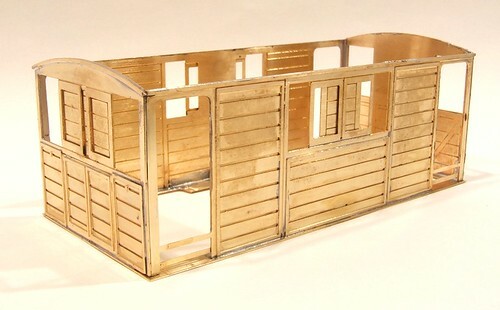 Steam tram interior detail begins with a bit of metal forming. 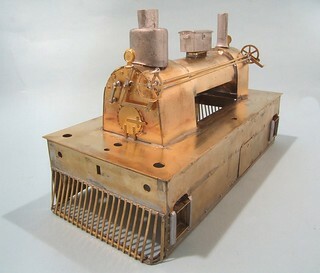 All the parts show - firebox, boiler and smokebox arrive flat and require bending before being soldered to the ends. 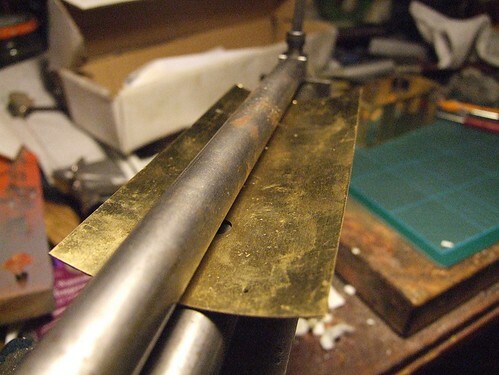 Putting the bends in the brass can be horribly complicated. If you are keen then you'll put the metal in some special rollers and gradually work the curve into it. Not everyone owns metal rollers as they aren't cheap. Largely by accident, I own two sets. I bent the metal around a Maglite torch. Well, it was handy. Once bent roughly to shape, I tack soldered the wrapper around the end, helped by the inclusion of marked centre lines by the designer. When happy, the joint is seamed - a curiously satisfying process I find. Fiddling the parts into alignment can be frustrating but once you are happy and the solder is running, this is what kit building is all about. 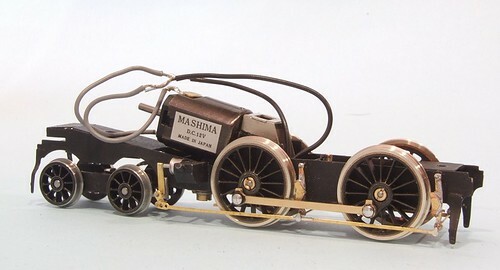 For legal reasons, steam engines are required to have their motion hidden away when running on street tramways. Personally, I think it's Heath and Safety gone mad and we'd never have suffered this sort of thing in the 1950's - erm, except we did. Anyway, at the ends of the engine, we find some cow catchers. 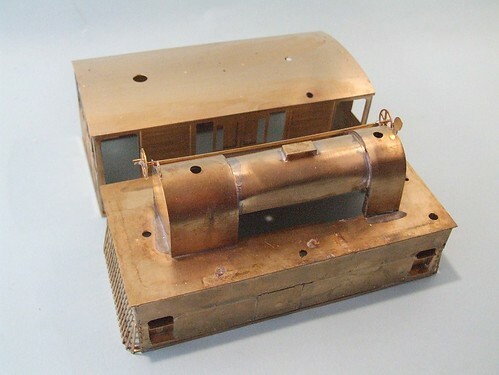 These are one of those bits on a model locomotive that can only be produced by etching or some very fiddly scratchbuilding. 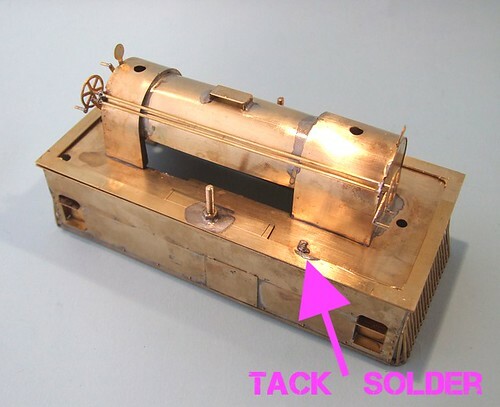 On this loco, they are found on the etch in three parts. First, there is a U-shaped hoop made up of a U and strip of brass. 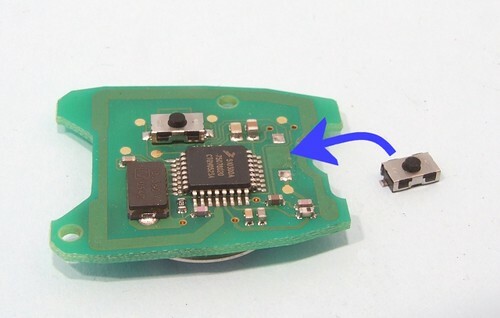 The later is bent up around a small screwdriver (to prom the curve) and soldered to the U. It's supplied over-long, handy as you don't have to be too precise with the bends. 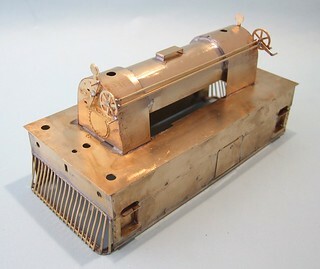 The U is then soldered to the half-etched end of the cowcatcher. This is bent up and then the instructions explain how to form the final part. I ignored these and just soldered the top edge of the cowcatcher to the buffer beam, bent it out and then twisted the U-shaped base back. This seems to work OK. I'd hoped to make the things up as separate items for attachment later but this wasn't to be. Didn't seem to matter though as they are surprisingly strong. Aprils issue of Model Boats Magazine hoves into view and the news found in the Test Bench section is mostly provided by my trip to the London Toyfair in January. I found quite a few nautical items and most of them made the pages of the magazine. Considering the conditions I took the photos in, they have turned out pretty well. Now all I have to do is persuade the makers to let me have the odd review sample! Most importantly though, after a sail, there wasn't a drop of water in the boat. Looks like the Ezicote stuff works well. 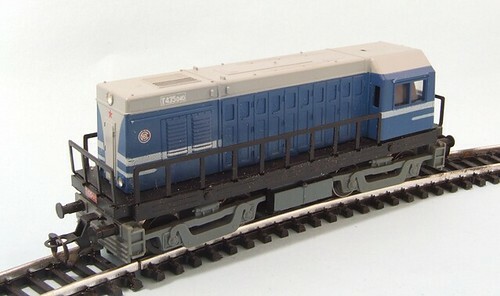 Or: Why it's handy to know a railway modeller sometimes. The problem - Pressing the lock button on our Berlingo's keyfob didn't lock the doors. The unlock button worked OK though. First thoughts were that the battery in the keyfob was on its way out. A quick check with Timpsons and Halfords suggested that you have to get a dealer to change this and any other course of action WILL RESULT IN DOOM. Apparently, if the battery is out for more than 30 seconds, the fob loses its memory and has to be reprogrammed. Anyway, we trundled down to the our local dealer and had a chat with the service department. They could change the battery and went off to do this. A few minutes later they returned with the fob and explained it wasn't the battery. 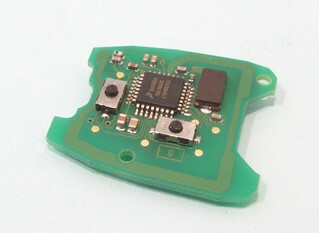 Under the rubberyplastic buttons, the switches are surface mount buttons and one of those had become detached from the circuit board. This explained why the lock button felt soft - it wasn't pressing on anything. Now we had two options. A new fob is £150 because it has to be programmed. However, the helpful guy suggested that if I was handy with a soldering iron, I could fix it myself. Well, as regular readers will know, I AM pretty handy with the solder so I reckoned it was worth a go. After all, we still had the switch which had been rattling around in the fob. They even helpfully put it in an envelope so I didn't lose it. Back home, I opened the fob by twisting a 20p coin in the top, fired up my Maplin soldering station, placed a tiny bit of Copalux flux on the solder pads, popped the switch in position and heated the joints until the solder melted. This took a couple of seconds for each joint - if you try this, don't leave the iron on too long, just watch the solder melt, take the heat away and blow on the joint. I'll admit I did take the time to look at the switch and work out which way around it was before it fell off. The shape of the solder joints give that away, but I doubt very much if it really matters. Before putting the circuit board back in the key, I took it out and tested my efforts with the car - everything worked perfectly. The board was placed in the fob, snapped back together and has worked fine ever since. Not a bad repair. Even if I'd had to buy all the equipment (soldering station, flux and a tiny bit of solder) this would still be less than the official repair. I suspect that if the switch had been glued back into position with the contacts touching the solder pads, it would probably still work. The result wouldn't be as good as solder but if it's what you've got... Just don't get glue on the solder pads, pop a tiny amount under the switch body. Superglue applied with a pin would be best (place a drop on glue on some plastic and pick a tiny drop up with the end of a pin) but, I stress, I've not tried this it was my plan B. But what if it had been the battery? Well, the service guys took the battery out of the fob while I was there, left it for a few seconds and slid it back in. No tools were required and more importantly, no DOOM happened. As far as I can tell (and I've not tried it but can't see a problem), you just slide the old battery out by pushing it gently and slide in a new one. 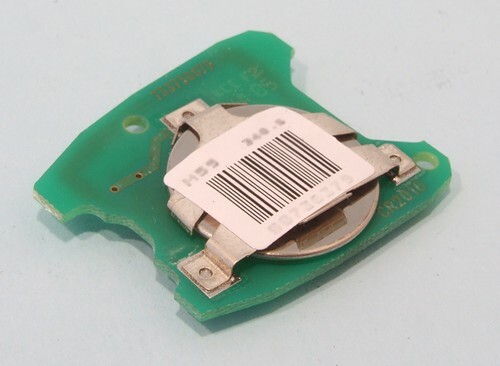 According to the circuit board, it takes a CR2016 cell which is commonly available in the shops. Have one to hand before you fiddle with it and there is no chance you'll have the battery out for greater than 30 seconds thus bringing DOOM upon you, if you believe that sort of thing. 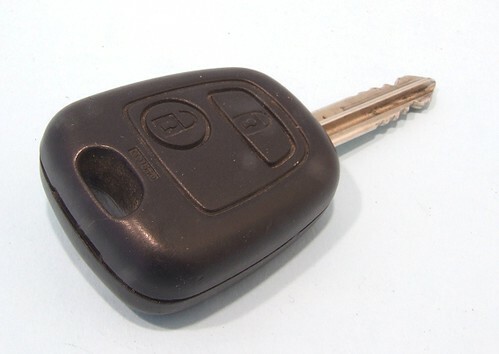 My suspicion is that the 30 second rule applies to more complicated keyfobs than the Berlingo one but it's safer to say no to all of them and let the dealer, who should know about these things, take the risk of poking around. Anyway, thanks very much to the service guys at Murley Citroen (Leamington Branch), who could have tried it on by telling us the fob had broken in an effort to sell a new one. Instead, they took a few minutes to explain the problem, apologise that they couldn't fix it, and then make a sensible suggestion. If I were in the market for a new car, it's the first place I'd go. Legal note: This is an accurate description of what I did. Follow these notes at your own discretion. If it all goes wrong, it's not my fault. If you aren't confident, get a professional to take a look. Fred Dibnah is easily the most recognisable industrial archeological enthusiast who ever lived. Even those with no more than a passing interesting in smokey old buildings will have heard of him, probably through one of his numerous telly shows. Spotting a miniature Fred on the Duncan Models stand last weekend, I though it would be great fun to have him on Clayhanger Yard and see how many people spot him. The figure is supplied as an unpainted whitemetal casting. There's no flash or mould lines to deal with so it's straight on with a spray of primer - Humbrol No1 in this case as I had a can within reach. Looking at pictures of the man, the closest match I could find to the clothes the model is wearing is a dark blue jacket over a black waistcoat. The later isn't the same black as his trousers - I suspect the waistcoat is a felt material which reflects the light differently. His cap is a similar black. Skin tones - Humbrol 61(Flesh) dry brushed with Revel flesh, although Humbrols version with a touch of white mixed in would be OK.
That list ought to be helpful for anyone who fancies painting the same figure. The colour matches look pretty accurate to me. Application was my first serious use of the Humbrol Detail Brushes. These worked well. The triangular handles take a little getting used too but they do provide a good grip. The only problem was that working under a magnifying glass, they were a bit long and hit the lens until I got the hang of it. If this was a bit problem then lopping a few cm off then end wouldn't be a problem. In the raw whitmetal, Fred looked like an excellent likeness. Painted, the chin is perhaps a bit Desperate Dan but that's probably due to my crudeness with spectacle painting. 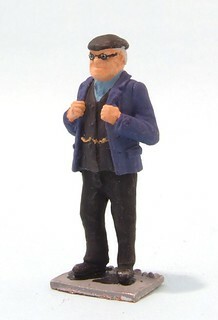 I suspect a specialist figure painter would do a better job. Not to worry, once he's on the layout, with that paving slab he stands on buried in the dirt, I think he'll look the part. This is the 2,500th entry on my blog. I hope you've been enjoying them so far. I've not run out of inspiration so plan to be adding to the total for a while yet! In doing all this, I've become a bit of an expert on blogging, so if anyone wants advice, please get in touch. The skirts show yesterday are attached to the underside of one of the footplates. If I read the instructions correctly, I'm supposed to solder the pair of identical footplates together first, but I can't see the point of this. When I built the 3mm scale version of this kit. I was able to have the loco body on one footplate and the skirts on another. 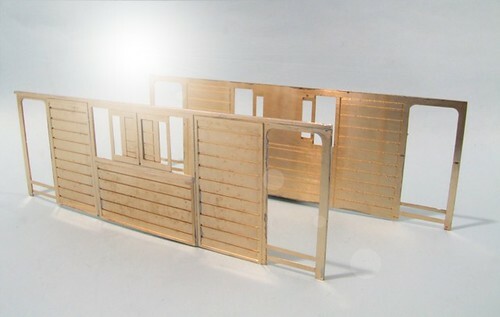 This allows the model to be split for painting and working on the interior details. Possibly this has been changed on current kits as the instructions I'm reading seem to be written by Moses. Not that this matters as the kit is so well designed that it's not difficult to work out how to assemble it using a sketches supplied. There's quite a mass of metal to deal with here. Using the photos I took of the model built by the manufacturers, I worked out that the skirts are overlap the buffer beam etched parts. Everything was tack-soldered in place with the electric iron. Once happy, the gas torch made for nice neat seam joins. Using gas pumps so much heat into the solder, the brass doesn't get time to heat up for overlays and steps stay where they were put. After a quick clean up, the skirts were placed on the chassis at which point I though the gearbox was too wide for the hole. The I realised that it only goes in the correct was round as the hole is stepped to be wider at one end. A clever person would have spotted this straight away. Putting the Y6 tram skirts together was to ber a nice quick job. In the end, it took best part of two hours, although I was half watching the film Unstoppable as I worked. The US train shots were interesting even if the plot is bit rubbish. Anyway, as I watched American trains derail, I started to attach the half-etched overlays to the full-etched skirts. My method was to slosh loads of flux around and then try to run some solder into the edges of the laminations. This sort of worked but I found the 45W iron wasn't really cutting the mustard but a small gas torch provided enough heat. After this the burnishing started. A good, hard, rubbing with a fibreglass stick and pen cleaned away the excess solder. The result looks pretty good although it was a lot of work. Much more work than getting the RSU out and using that which I was just too lazy to do. So there I am, standing by the Connoisseur Kits stand at Kettering show and the guy behind it says to his mate, "He says you've made your dimples too large." It seems I have readers in many places! Anyway, it was explained to me that had I bothered to read the instructions and not just look at the pictures, I'd have realised that this kit was built for people with far more limited tool kits than mine. Or at least, an audience beyond those daft enough to splash out the thick end of a hundred quid on a metal bomping tool. The correct method involves a blunt scriber or nail bushed through from the back with the metal face down on some lead. Just like I used to do before I bought the "correct" tool. It works too. My tool was a blunt screw rather than a nail and I used to gently tap it with a small hammer but many of my engines have rivets embossed this way. Total cost for tools - Nill assuming you have a hammer (what modeller doesn't) and and old nail/screw probably retrieved from a tin in the garage. Lesson over, I did have the chance to take a good look at the finished model in the stand. It really looks the part and there is something about getting your hands on one that can't easily be replaced with photos. You can ask the nice, friendly people behind the stand for advice too - a good reason to visit model railway shows I think. 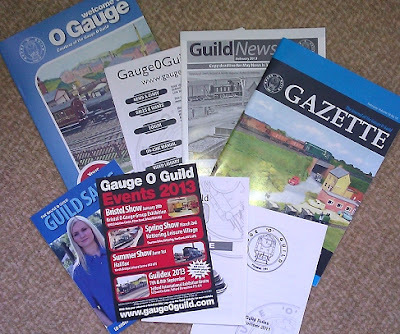 Last year, I tried to visit the Gauge O Guild show at Kettering and it all went a bit wrong. This year, I hoped it would be different. With my O gauge project on the go, I really needed a scale specific event to wander around to pick up the bits'n'pieces to finish the layout. I'd bought all the 7mm scale brick plasticard the local model shop had in stock anyway. Sadly, by this time, the car park was full and I was getting a dose of deja vu. This time though, we were handed a map printed with both route and surrounding streets. Better still, exiting the car park we spotted arrows on the lamp posts guiding the way. Top work from someone - a fantastic job. Arriving in the tiny overflow car park we were lucky to be the last but one car in. A quick trip on the "courteous bus" saw us back at the hall and in the queue. At the pay desk, I mentioned that I planned to join the Guild at the show and was directed to a new table where details and money were taken. This saved me £2 on the entry fee and since I'd planned to do it anyway, was well worth the effort. Inside, the hall were a small selection of minimum space O gauge layouts and a text track. The rest of the room was filled with traders. Judging by the people leaving after an hour of opening, they had been doing brisk business. This was later confirmed by one trader who said he felt the recession might be improving - either that or people were going to spend all their money to deny the chancellor an opportunity to get his paws on it ! Wandering around, I managed to pick up everything I was looking for and a few bits I wasn't. It still amazes me the amount produced in what is still largely a modellers scale. If funds had been no object, I could have happily filled the back of the car with goodies. Another pleasant surprise was the cost of refreshments. We tried too late for the sausage or bacon baps (£3 each) but at least cups of tea at a pound a go were welcome. Compared to most leisure centre catering, that's a bargain and that didn't taste to bad either. An interesting event. If you wanted to see trains charging around then probably not for you. Me, I like little layouts and loved every one on show. 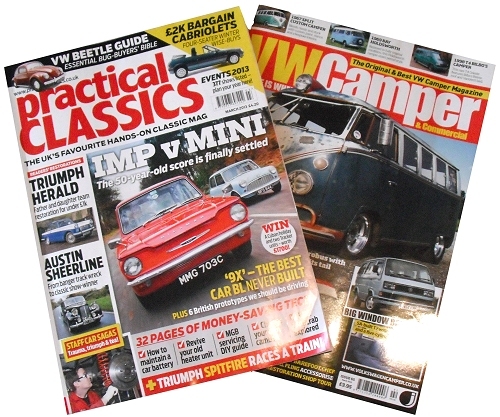 This week I cancelled my subscription to VW Camper & Commercial magazine. I've been with it since issue 1, when it was a quarterly mag you couldn't get in the shops, to the current monthly issues I could pick up in Smiths. It's not the exclusivity that has pushed me away, it's the content. There's nothing wrong with it really. Lots of nice pictures of VeeDubs and a few event reports. If you like that sort of thing then great. What I don't like is the content of the articles. Basically, what happens is someone buys a camper, probably importing it from the USA. They then hand it over to a company who restore or customise it. Another company will do the interior. There will be some problems which were solved by an engineering guru from yet another firm. Compare this to Practical Classics. Each article involves the writer battling with rust and recalcitrant mechanical parts. While something like painting might be contracted out, although it often isn't, the bulk of the work is done by the owner. The end result is a triumph (other car makes are available) of their labours. Guess which mag I read right through quickly and which sat around unopened for a couple of days. The same sort of thing is happening with model railways (see, I said I'd get there). Less and less people make anything, preferring to buy locos, rolling stock, buildings, road vehicles, and anything else straight from the shop. It's happening in all the popular scales but especially in OO. The worst place fro it though is in the finescale end of the hobby. People who can afford to employ the best model makers in the country are popping up and writing layout articles. Once P4 and EM modelling involved some kit building and effort. Now you just swap the wheels out of your freshly boxed RTR and plonk it on the track. If you have big money, you order a beautifully made model from someone else. 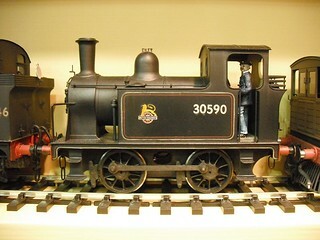 We even had someone who had done this try and enter the loco in a club modelling competition years ago! Of course there's nothing wrong with a bit of chequebook modelling I'm told. People say that if they could afford to spend the cash they would and use the time freed up to work on the bits they enjoy. Truth is, I suspect, what they mean is if they had the money, a complete model railway would be built and installed in their purpose built room. The thing is, once that happens, surely you'd play with it for a couple of weeks. Perhaps show it off to your friends, and then what? Shut the door and go and do something else I suspect. My take on all this? Simple - you get out of a hobby what you put in. You can be a VW owner who doesn't know where the fuel pump is and shouts abuse at fellow owners unlucky enough to break down (outside Stanford Hall about 6 years ago since you ask) because you can't comprehend that a 40 year old car isn't as reliable as a modern one. You probably sell your bus every year looking for a new shiny toy. 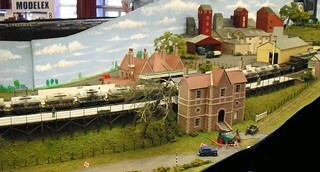 Likewise, you can treat a model railway like a flat screen TV. You buy it, press all the buttons to make the noises and light come on and then go and buy another one. Or you can work on the car or layout yourself. Maybe it won't be as good as the one a professional can build for you, but it has one important element. It's Yours. There is a little bit of You in there and you can justifiably be proud of something far greater than just writing a cheque. Just a quick update on my Dad's Wavemaster build first mentioned in January. The hull outer sheets were fitted with difficulty. Getting the pointy bit at the front in place was a nightmare. One of the bits of wood being short didn't help either. Anyway, we followed the normal method of fitting the sides first and then the bottom. 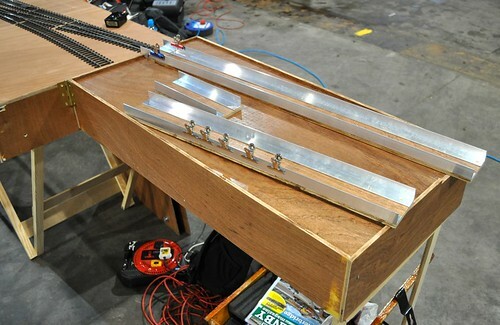 We should have done it the other way around as clamping the bottom sheet is a heck of a lot easier this way. After this, the wood was smoothed, filled and covered in some Deluxe Materials Eze-cote - a water based alternative to fibreglass and resin. This was very easy to use and seems to have worked well. It's a heck of a lot less smelly than fibreglass anyway. Finally a coat of Halford spray enamel and it was time to fit the mechanical bits. More on this once we've tested them on the water. The first job on the Y6 bodywork is to push through the rivets in the side skirts. To aid the modeller, half-etch dimples are found on the back of the metal. Well, they would aid the modeller if they weren't so large! Aiming the rivet press is a challenge. Even using the bare metal spike rather than the thinner etched one doesn't help. The best I could do was squint and try to aim the spike into the middle of the dimple. Not a neat line of rivets but a wobbly one. The long horrizontal set are OK but the verticals have the odd-mis-placed lumps. If I did this again, I might draw some lines to help me but I'm not sure sighting them under the press would be possible.